What sounds more yummy than your very own personal chocolate cake? I’m sure many of you just cringed at the thought of having to bake, but I assure you this is the easiest cake you will ever make. Chocolate mug cake has become a very trendy dessert found on Pinterest, but I took on the challenge of making a healthy version that I could enjoy guilt-free. 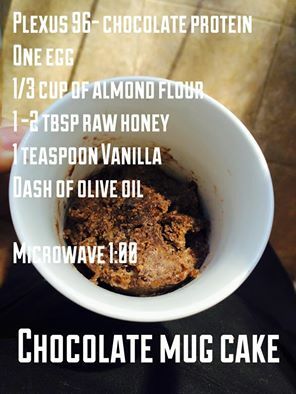 This chocolate mug cake is paleo, gluten-free, packed with protein and contains no artificial sweeteners! What’s even better, it only takes 1:00 to cook. Mix all ingredients into a microwave safe coffee mug and microwave on high for 1:00. It really is that simple! Spice it up by adding cinnamon and serving it with fresh strawberries. I also like to switch it up by using vanilla protein powder and adding blueberries. This will work with any protein powder but I recommend looking for one that does not contain any artificial ingredients and is a whey protein. Enjoy!! Get healthy living tips, exercises, recipes, event information and more delivered right to your inbox.